Junk mail creates 4 million tons of preventable waste each year! Visit Ecocycle.org for guidance on how to stop receiving junk mail. 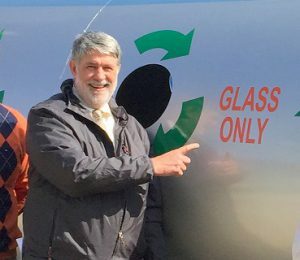 BATAVIA, Ohio – Paul Braasch, a champion for the environment in Clermont County and throughout Ohio, is retiring after 25 years at Clermont County, as Director of the Adams-Clermont Solid Waste District and the county’s Office of Environmental Quality. Braasch has had an enormous impact on Clermont County as an advocate for recycling, water quality, and environmental stewardship. His success, he says, lies in his ability to bring people to the table and work together. Braasch, who graduated with a Bachelor of Science in agriculture from the University of Kentucky, developed expertise in recycling when he worked in the 1980s at Adams Brown Recycling in Georgetown, now the largest non-profit recycler in the State of Ohio. Later, as an employee with SCS Engineers, an environmental consulting firm, they wrote solid waste plans for 19 counties throughout Ohio as the Ohio Legislature required. “I wrote the Adams-Clermont Solid Waste Plan and then I was recruited to come to Clermont County,” he said. He began his career at the county in 1993. Braasch is proud of the “unprecedented” level of research done on water quality in the East Fork watershed, under the auspices of the East Fork Watershed Cooperative. Clermont County took over the operation of a Procter & Gamble stream research facility in Miami Township, on the banks of the East Fork of the Little Miami River, and now leases it to the U.S. Environmental Protection Agency. The EPA conducts research of the watershed from this facility. Best management practices that farmers are adopting include the use of cover crops and building wetlands on farm property to soak up nutrients. Braasch is convinced that over time, these practices will become widespread and that harmful algal blooms, which have plagued Harsha Lake, as well as the Ohio River, will become less pervasive. Braasch says Clermont County must continue to be vigilant in monitoring the CECOS International hazardous waste facility in Jackson Township, which stopped receiving waste in 1988 and closed in 1997. Clermont County monitors the site, along with the U.S. EPA and Ohio EPA. The hazardous waste site is upstream of Harsha Lake, which supplies some of the county’s water. Braasch was instrumental in negotiating an agreement between CECOS and the county, approved in 2012, that added groundwater monitoring wells at the site. Hannah Lubbers, who has worked with Braasch for 10 years at the Solid Waste District and OEQ, will become director of both on Feb. 1. © 2019, Office of Environmental Quality. All Rights Reserved.